Burnley earned a trip to Nottingham Forest in the last 16 of the FA Youth Cup after an impressive win over Cardiff City at Turf Moor on Tuesday night. 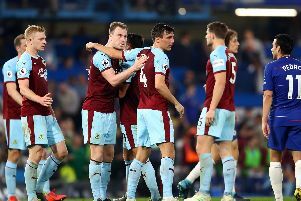 The Clarets anticipated a tough tie against a club - in Category 2 - a level higher than Burnley in the EPPP, and more used to facing stronger opposition on a weekly basis. But Andy Farrell and Terry Pashley’s players - three years after guiding them to the semi-finals of the competition - upset the odds to sen the Bluebirds packing on a freezing cold night. Burnley bossed proceedings in the first half, but took until three minutes before half-time to make their dominance count. Andy Nugent forced a save from Joe Massaro from a free kick, before Andreas Bianga had an effort blocked from a Brad Jackson corner. Bianga broke down the right before firing over, and the Clarets had another good opening just before the half hour when Khius Metz latched onto a flick from Ntumba Massanka, but saw his shot saved. Massanka measured a curler just over after a pass from Christian Hill 18 yards out, before the Clarets deservedly took the lead when Wilson beat Massaro from just outside the area. Moments later, the Cardiff keeper hadf to be at his best to keep out a curler from Jackson, after good work from Metz, and in injury time, Jackson was also denied by Massaro, who was equal to his side-foot shot. Cardiff made two changes at the break, introducing Elijah Phipps and Jamie Veale for Jake Watkins and William Taylor, and the pair almost made an immediate impact, Phipps heading wide from a Veale corner. Massanka dragged a shot across the face of goal, and at the other end, Abdifatah Noor fired at Yony Aghayere. Burnley’s Hamam El-Fitouri took the sting out of Rollin Menayese’s shot at the far post, at the expense of a corner, but the introduction of Jamie Frost, for Massanka, midway through the half gave the Clarets a lift. Frost stood up a ball which Metz headed wide, before he doubled Burnley’s lead from close range from a Jackson centre 20 minutes from time. Veale pulled one back with nine minutes left with a fine free kick, but Jackson settled matters three minutes from time, sending Massatro the wrong way, with Frost claiming the assist. Burnley: Aghayere, El-Fitouri (Dixon 86), Azam, Hobson, Nugent, Jackson, Bianga, Wilson, Hill, Massanka (Frost 66), Metz. Subs not used: King, Crawford, Dolling. Cardiff: Massaro, Rees, Baker, Patten, Rollin Menayese, Williams, Watkins (Phipps 46), Yonga-Toonga (So Sani 75), Elvis Menayese, Taylor (Veale 46), Noor. Subs: Coughlan, Coxe.